This is not hard to imagine when you start adding up the secondary impacts of the crisis. Farmers are unable to harvest their fields or get their crops to market. Banks and government offices are partially or completely closed. Some companies have suspended operations. Quarantines, curfews and border closures are preventing people from moving freely to work, to their fields or to market. Scores of people have lost their jobs. In Liberia, nearly half of those working when the outbreak was first detected in March 2014 are no longer employed. 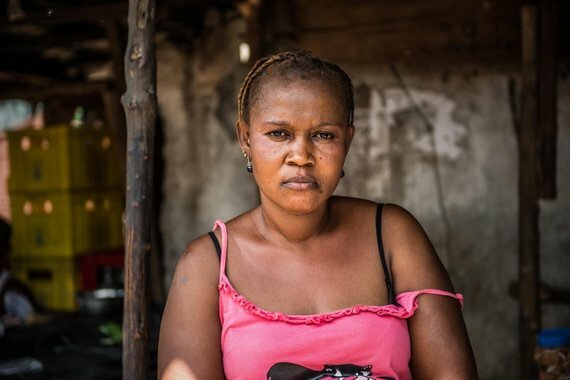 "The road to my business place in Liberia has been closed," says Mabinti Koroma (pictured), who has lost three family members to the disease and has seen her business suffer. "Even my husband who is a carpenter is not having contracts any more. My six children are all just sitting at home idly." Oxfam supports long-term development, advocacy and emergency programs, such as clean water and sanitation, but we don't provide direct medical assistance, so the crisis has really pushed us to develop new partnerships and ways of working across multi-sectors, including the private sector, which is increasingly playing a role in humanitarian relief. At the local level, it is after all communities, as well as businesses that are often the first responders after a crisis -- shopkeepers open their stores and warehouses when disasters strike; businesses distribute food, water, clothing and other goods. At the international level, the UN Global Compact was set up to "harness the energy and influence of multinational corporations to act as good corporate citizens" and foster business partnerships with humanitarian agencies when a disaster hits. In the case of Ebola, a coalition of more than 48 companies with major assets and operations in West Africa has come together as the Ebola Private Sector Mobilization Group. Their members have provided direct support through donating funding, personnel, equipment, and through building infrastructure, as well as lending expertise in construction, logistics, and distribution services. This is very welcome but the scale of the epidemic requires greater investments from all of us, including business support. The private sector should continue to directly fund and resource the response -- for example, by improving roads, transport links and communications to get affected people to medical facilities and Ebola samples to laboratories. Companies with operations and supply chains across affected countries should keep their business operations open so people can earn a wage. While not easy in the climate of infectious disease it is crucial if the countries are to recover from this emergency. The private sector support of long-term economic recovery is critical as well, through positive business practices, such as paying fair wages and building the vocational skills of communities. Of course, coordination is key and it is the role of the United Nations to lead a comprehensive response to the crisis. UN agencies, donors such as the United States and England, as well at the private sector must provide quick, flexible funding to partners, increasing funding for community mobilization for prevention and preparedness not only in affected countries but in at-risk countries such as Guinea Bissau, Gambia and Senegal. And finally, NGOs like Oxfam need to do more to partner with local organizations and consult community members to identify the most vulnerable, such as children who have lost their parents and widows who are now head of households after losing their husbands. When the outbreak is finally under control, NGOs need to stay the course to strengthen the capacity of local organizations and governments to be prepared for the next crisis. Today, I will be joining leaders from the private sector, governments and civil society at the UN Headquarters to identify what has worked well and how we can foster more effective collaboration across sectors in the face of this mounting crisis and other crises to come. Because only if we all play our part can we break Ebola transmission chains and be prepared for the next humanitarian crisis.